In an effort to maintain a high level of student success and public health, and in accordance with state law, all students are prohibited from possession and/or consumption of alcohol on campus outside of authorized areas. Any student under the age of twenty-one is strictly prohibited from possession and/or consumption of alcohol on campus or at off-campus University-hosted events. Students’ events are not allowed to serve or sell alcohol on campus; thus, University events, meetings and activities that are student club and/or student managed are not considered University events under this definition, unless they are under the direction and control of a University host and have an approved permit. A student should not hesitate to report an incident of possible alcohol poisoning or other drug overdose due to concerns about potential disciplinary action for violating the Standards for Student Conduct. Student safety and health are paramount considerations. Obtaining necessary medical assistance could be considered a mitigating factor on a case-by-case basis when evaluating the imposition of campus disciplinary charges for consuming or providing alcohol or other drugs. Even if no disciplinary charges are imposed, students may still be required to participate in educational programs designed to promote student safety. This protocol does not preclude disciplinary action for other violations such as assault, hazing, or sexual misconduct that might arise from the same incident. Cooperate with emergency personnel and University employees during the incident and during any subsequent investigation. If the consumption of alcohol or other drugs occurred during an event sponsored, organized, or supported by a student group or club, Cal Poly will consider the reporting of the incident as a mitigating factor when determining any disciplinary action imposed on the student group or club. 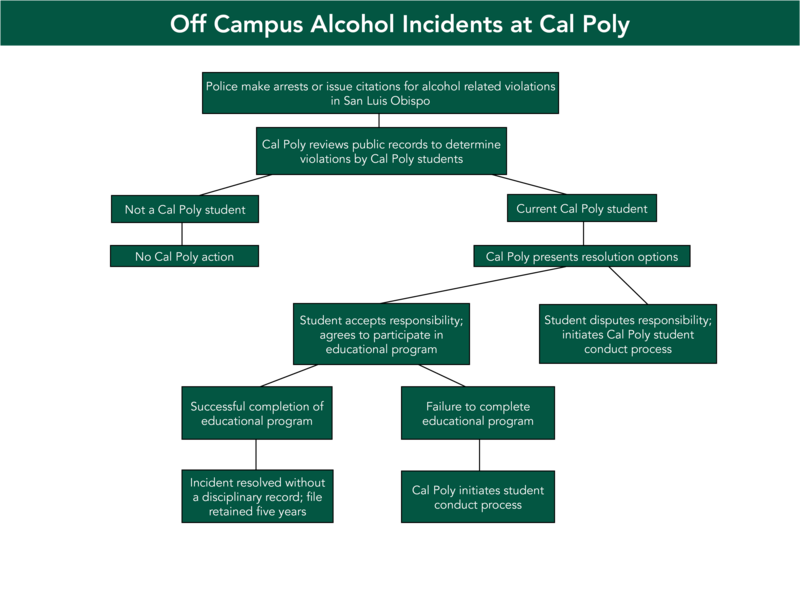 Other mitigating circumstances could include the efforts made by hosts or officers to prevent the situation, participation in Cal Poly educational programs designed to prevent such incidents, and cooperation with any Cal Poly investigation of the incident. Conversely, failure to report such an occurrence would be considered an aggravating factor when imposing any disciplinary sanctions. Cal Poly - With Us provides information about caring for others.